Some people call it Okra, a few refer to it by the name of Lady's Finger and for many of us its Bhindi. A perennial veggie which goes so well with your Lunches and Dinners, be it an elaborated feast or a simple daily menu! No wonder, its the most beloved vegetable across all age groups. 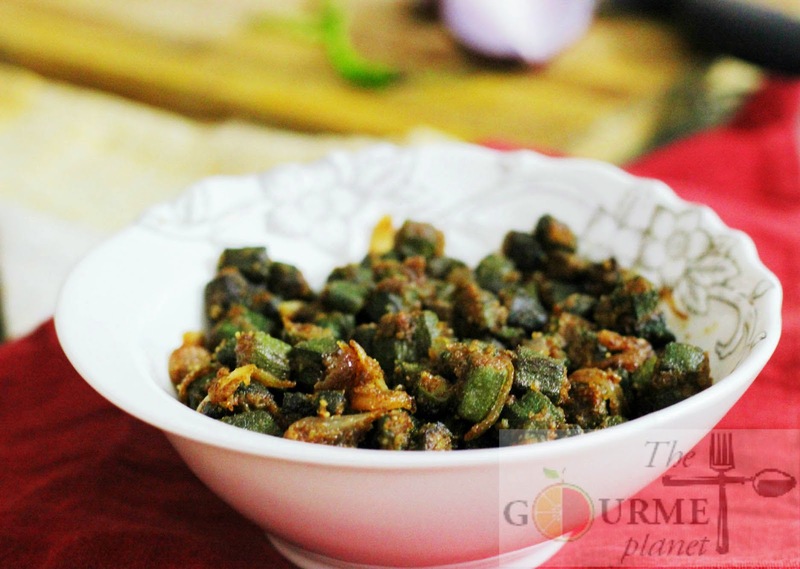 If you wish to give a bit of twist to your regular Bhindi, try my way. The nuttiness of roasted peanuts and aroma of freshly grounded sambar powder, gives it a different flavor and will indeed leave your taste buds tickling & craving for more! 1. Dry roast the peanuts and yellow mustard seeds separately in a pan for 2-3 mins and the then let them cool for sometime. 2. Grind the peanuts and mustard seeds separately in a mixer. 3. Wash the bhindi well and wipe it with a clean kitchen towel or let it air dry completely. There should not be any moisture. 4. Trim the ends and cut the veggie into 1 inch length pieces. 7. Add cut bhindis to the pan and give a good toss to ensure the veggie is wrapped in the masala. 8. Lid the pan for 4-5 mins and intermittently keep stirring the bhindis. 9. Once the bhindi has cooked remove the lid and further stir and add roasted ground peanuts. 10. Stir for a while and let it cook for another 2-4 mins. 11. Finally add ground mustard seeds and give a good toss. NOTE: The texture of the final cooked Bhindi must not be slimy and sticky so do not lid for more than the time mentioned. Simple & Easy!Do give it a try and certainly you will love the burst of diverse tastes.